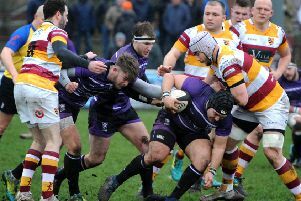 Head coach Warren Spragg has warned that winning alone won’t be enough if his Fylde RFC side are to topple top two Hull Ionians and Chester in National Two North. Last Saturday’s nailbiting 14-13 victory over Leicester Lions in their first home game of 2019 stretched Fylde’s unbeaten run to nine, though they missed out on a four-try bonus point. And Spragg insists it is critical they turn their four-point wins into fives over the remaining 12 matches. Fylde trail Hull by 10 points and Chester by four, with a fixture against both clubs yet to play. Spragg told The Gazette: “It’s crucial to move up in fives. If we are still four points behind Chester when we play them next month we could win the game and still be behind if we only manage four points and they get one. “The next challenge is to keep on winning and to make sure they are five-point wins. It’s four weeks until that showdown in Chester and Fylde’s immediate challenge is a visit to Sheffield Tigers tomorrow. 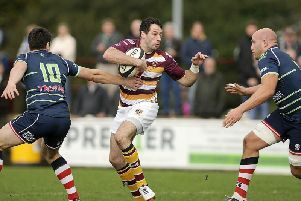 Fylde hope to involve South African Lex Botha, a powerhouse of an outside back, to boost their strike threat. Spragg added: “Lex has been training with us for a while but has sorted out his visa since Christmas. A back-line player already picking up plaudits is Tom Carleton, who scored his 14th try of the season against Leicester, and Spragg says there is more to come from the fast-finishing full-back. He said: “Tom is joint-second in the scoring table for our league. It’s a decent return and he’s averaging almost a try a game, but he has more in him and could be scoring 30 a season! The news on the injury front ahead of the visit to Sheffield is mixed. Olli Parkinson was stretchered off against Leicester and Fylde were last night still waiting to learn the extent of the knee damage. Ben Vernon is expected to return to action tomorrow, though Elliot Horner and Adam Joyner again miss out. Jacob Conner and Cam Crampton were also forced off last Saturday. Neither injury is serious but scrum-half Crampton’s hamstring may keep him out tomorrow, though Conner should be available. Dave Fairbrother (shoulder) is still some way from a comeback and surgery remains on option. Tomorrow’s South Yorkshire opponents have slipped to 12th after three successive defeats, though they went down by just four points at Chester last weekend.